There are moments on trips like this where you just might be able fold into the local audience and witness things as they always are. Watching the ballroom dancers take the floor on our Friday night show in Loužnice crossed that threshold. That night there was a event at the local “Sokol” and we were invited to be the special guests. Sokolovna’s are in nearly ever town, having started in the late 1860’s as something of a fitness center, adult education center and performance space rolled into one. (Read about them HERE. The history is fascinating.) During the first bands performance, several couples got up and danced beautifully, almost in unison, to Czech bluegrass. Hard to imagine the effort that went into making 52 of these halfway across the world. 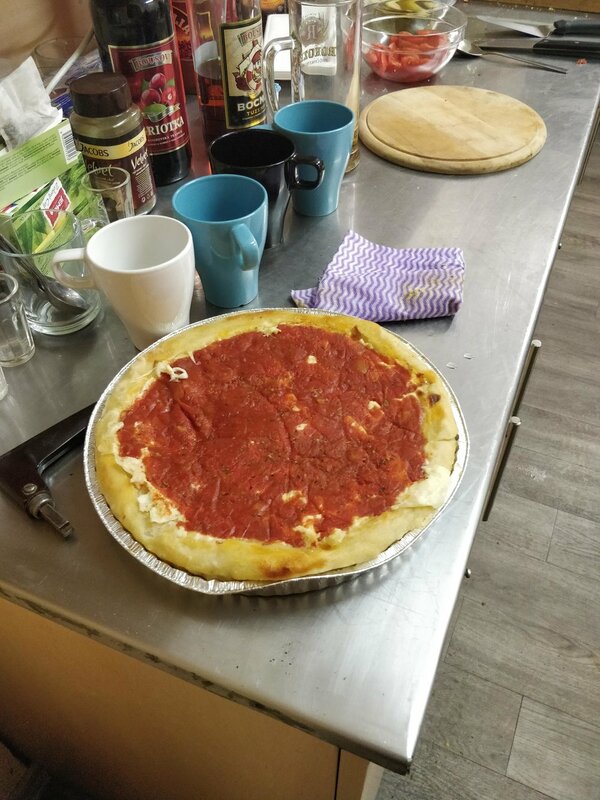 Would you believe that there was Chicago style deep dish pizza and hotdogs? Mimi gathered recipes (including her grandmothers homemade relish) and enlisted some other local help to make 52 pizza’s and hotdogs with almost all the fixings. (No celery salt…but also no ketchup! Woo!) They were delicious. For those of you who were at our “Bohemian Bluegrass Bash” in Chicago, this was the inspiration for it. We were told this was going to happen before we went and thought we could do the same in Chicago. Thanks again to Cafe Prague on Belmont Ave in Chicago for that delicious food! Poster promoting Chicago night in Loužnice. Pronunced “Louznitchia”. Kind of. Stunningly beautiful mosaic inside the Sokolovna, possibly from communist era. HHP + the Czech band “Handl” performing together at “Chicago Night” in Loužnice. There were several bands playing that night, but Handle was the one we really got to enjoy and get into. They’re one of many Czech bluegrass bands across the country and they were fantastic. We’re going to dive more into why this amazing movement exists in here on our Bluegrass Ambassadors podcast, but suffice it to say that the quality of music that comes out of this country is staggering. A town square of Jablonec Nad Nisou. Translated as Jablonec on the Nisa River. The following day was a festival down the road a bit in Jablonec Nad Nisou (Jablonec by the river). We didn’t know this ahead of time but the festival consisted about 6 Czech bluegrass bands competing for a cooked goose. We were the featured band and exempted from the competition, but no kidding, before we played our encore they announced the winner and presented them with a giant cooked goose on a platter. It was so chaotic that we missed the opportunity to get a picture, but it really happened. It turns out that it’s tradition to celebrate St. Martin’s Day. Jam session after our Bluegrass Ambassadors workshop. Performing at the fest, right before the goose drops! One of the best moments of the trip so far happened at our Bluegrass Ambassadors workshop before the festival started. There was a mix of players there and we gave a presentation, playing music from Kenya, Kyrgyzstan and more. Naturally we had to end with Jožin z Bažin, the Czech song we learned for this trip. This picture below depicts so perfectly the moment of delight, fascination and love. After we finished singing, the man with the hat on the right said something in Czech and everyone laughed. Our translator “Bohuslav” leaned over and said “He thinks that must be what they sound like when they speak English.” We can only imagine he’s right. Here’s a quick video of our performance of the song at the festival itself. As we sign off here to head elsewhere in Europe, we want to say thanks to all the people who made this possible. Mimi on the ground here in Czech was an incredible joy to work with and really made it possible to have a huge impact on the kids. Her love for both Czech Republic, children and Chicago was a shining light throughout our time here. Be sure to check out her amazing Blue Owl Library. Also Reverb.com for giving us the opportunity to actually bring instruments for the kids and leave them at the Blue Owl in perpetuity. And most importantly, the people of Loužnice, Železný Brod and Jablonec nad Nisou for welcoming and letting 4 midwest boys see, hear and fall in love with this part of the world. We’ll be back!